nv R.H. Coutier, Tradition, Grand Cru Brut Tradition Champagne, Ambonnay, France. The brilliant R. H. Coutier Grand Cru Brut Tradition, 70% Pinot Noir and 30 Chardonnay, coming from the Pinot leaning village of Ambonnay is an organic and grower Champagne that impresses for it’s depth and decadence, while being crystalline, pure and full of energy, it’s wonderfully dry on the palate and rich in character. The youthful Antoine Coutier and team are making some amazing all Grand Cru grower fizz these days, and these new release, especially this Brut Tradition, disgorged in July 2017, based on mostly on 2013 vintage, are great values, they rival some far more expensive offerings from this particular village and region, in fact it held up well against a to die for 2002 Bollinger R.D. tasted along side! The nose has plenty of yeasty charm and white flowers with a hint of wet stones and short bread biscuit, which leads to an opulent palate with it’s ultra fine mousse and vinous textural elegance, shows apple, lemon and doughy notes with a hint of chalk and hazelnut. Again the luxurious mouth feel gives a gorgeous pleasing sensation, though it gets a lift from it’s vital acidity and the micro bubbles, there is also a sense of Pinot Noir tension and structure that makes a serious impact and let’s you know you are drinking something remarkable. 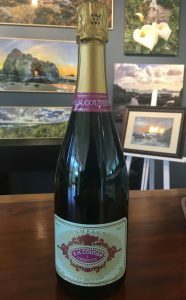 The unique and individual personality of this R. H. Coutier make it irresistible and it’s price make it a must have Champagne, this is top notch stuff, don’t miss, and be sure to search out their Brut Rose too!